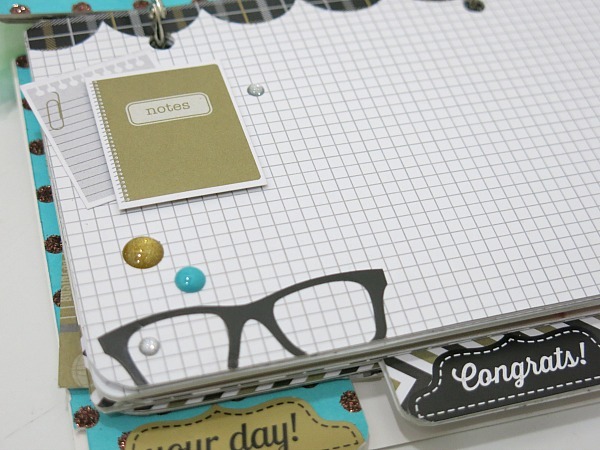 Doodlebug Design Inc Blog: The Graduates: Bride's Diary Mini Album + Giveaway final day! The Graduates: Bride's Diary Mini Album + Giveaway final day! Can you believe we have come to the final day of celebrating 'The Graduates' collection after two weeks of amazing inspiration from our design team. And lastly we have Melinda sharing her project that puts a slight twist on the way this collection can be visualised and used outside of the intended theme of graduation. 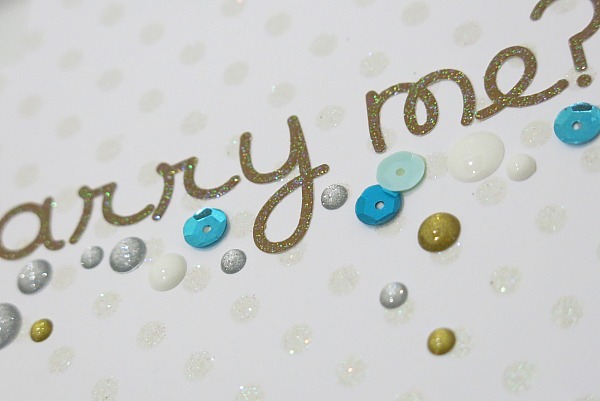 Hello, it's Melinda with you today and I have created a very glittery bridal diary for my niece who is getting married this coming August. After following her wedding Pinterest board I noticed she was pinning lots of chevron patterns, especially when they had sparkle. The front was covered in the new Gold metallic sugar coated chevron patterns so I kept the embellishing to a minimum as I really wanted the photo and pattern to be the main focus. Some pages are full of photos and romantic verses and other pages I've left relatively blank so my niece can add bits and pieces herself. Perhaps a note or two or maybe even a few photos along the way. And... the new Sprinkles are not only super sweet but they are also perfect for using in a mini album because they are gently rounded and quite soft so won't scratch any photos on the opposite pages. So many times we take photos of important events and post them onto Facebook so family and friends can stay in touch with our goings on. However, there are so many beautiful comments from people that never get seen or remembered by anyone other than ourselves because we don't usually print out our facebook posts. 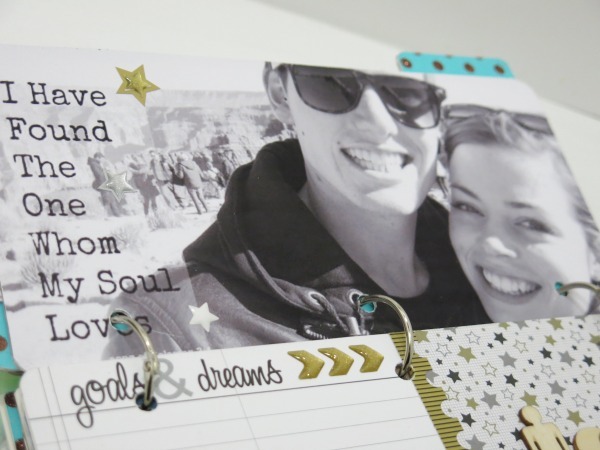 I've really started to think about this of late and have made it an important part of my scrapbooking to also capture those special 'social media' memories. I am such a complete sequin 'junky'... I cannot get enough of them and fortunately I know my niece kinda 'digs' them as well. Lucky for both of us as Doodlebug have them in every shade of every colour possible. We are giving away some amazing boxes filled with an assortment of our new The Graduates Collection to six lucky winners!! You will have until Saturday, May 17th at 12:00 noon MST to enter. We'll post the winner on Monday, 5/19. Good luck!! What a WONDERFUL mini album and GORGEOUS, THOUGHTFUL gift Melinda!!! 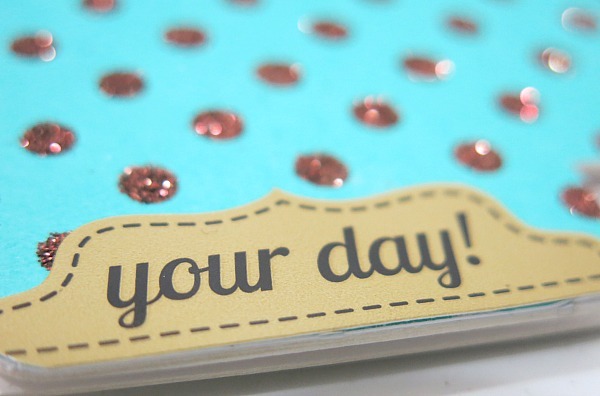 LOVE IT ALL, from the sparkle of the Chevron Sugar Coated Cardstock, to the pretty Washi, Sprinkles and Sequins!!! REALLY LOVE that you have shown an alternate use for this FABULOUS collection AND how well parts from different collections work together ... the pop of blue is DELICIOUS!!! THANK YOU for sharing ALL your CREATIVE INSPIRATION!!! LOVE the colours, sparkle and pretty detail of Melinda's gorgeous mini!!! Wonderful way to use this graduation themed collection for a bride and very CLEVER idea to include Facebook comments too!!! 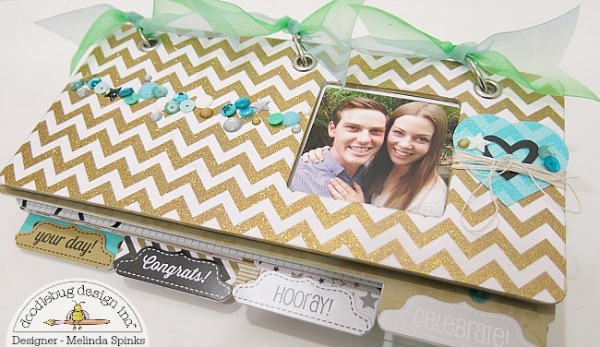 I pinned the cover of Melinda's mini album - LOVE the sparkly Chevron Sugar Coated Cardstock, Sprinkles and Sequins!!! I pinned the pic of the Sprinkles Vellum and Sugar Coated (Glittered) Cardstock - LOVE the sparkly, golden chevron Melinda used on the cover of this mini!!! I pinned the pic of the Sequins from the Graduates collection - Melinda used lots of these lovelies in her mini!!! 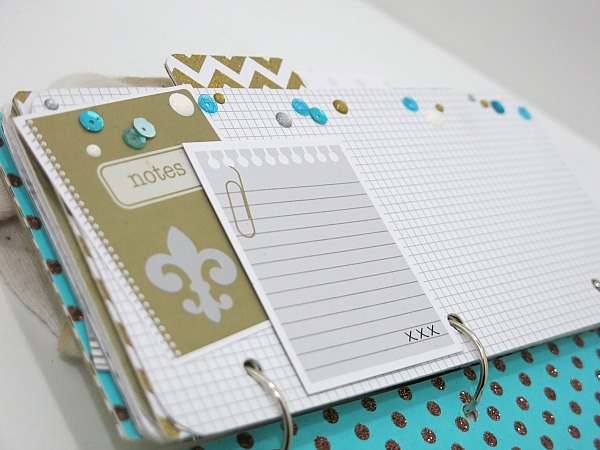 I pinned the pic of the new Washi Tapes from the Graduates collection - LOVE the page in Melinda's mini using the Fleur de Lis with the journaling!!! 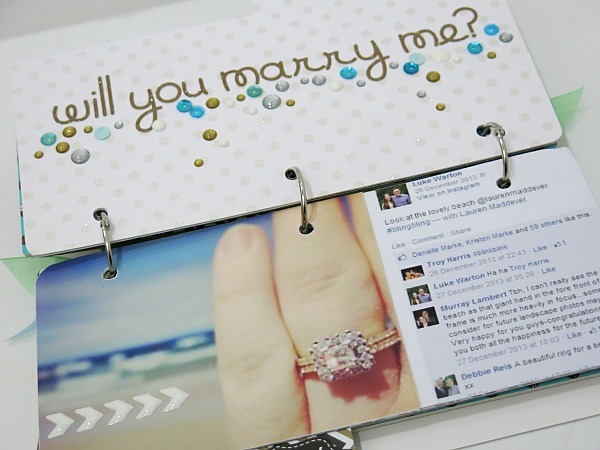 I pinned the 12x12 papers from the Graduate collection - LOVE how Melinda used them for creating her Bride's Diary Mini Album. Who would have thought to use panels from the "Study Hall" 12x12 paper for a wedding theme - WOW!!! I pinned the pic showing the Facebook post & comments in Melinda's mini - how clever to use FB this way, love the addition of the chevron/arrow Sprinkles!!! I pinned a page from the beautiful album with the golden alphas, sparkly Sprinkles and pretty sequins ... oh, and I think I spy some Sprinkles Vellum in the background too!!! I love this mini album!! My son recently married and this would be great to do up real quick to give my daughter-in-law for her birthday which is coming up soon in July. I just had to pop on over and tell Melinda how much I adore this fun mini!!! I love how you've used the Facebook commentary here as well. Super theme and idea! Always love the things that Melinda creates! Always something unique and different. She always thinks out of the box. I love the facebook idea, and hadn't really thought of capturing that. This collection is just so cute and versatile! 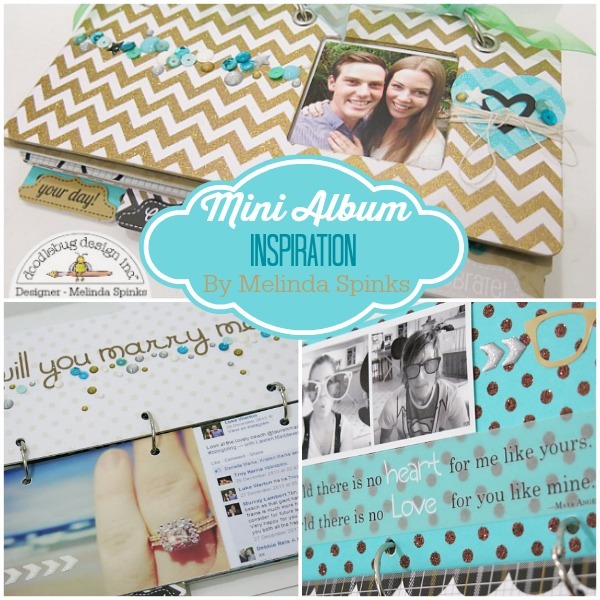 I just pinned the photo of Melinda's project showing the beautiful album project. Also definitely had to pin the photo showing the use of Facebook capture for reminding me to try this! Loved the use of the stickers as tabs on the edge of the album, so I pinned that also! I pinned the photo showing the use of the Notebook paper and all the wonderful sequins and enamels, how clever! The use of the fleur de lis washi tape and the white sprinkles vellum paper and the gold enamels is so beautiful! 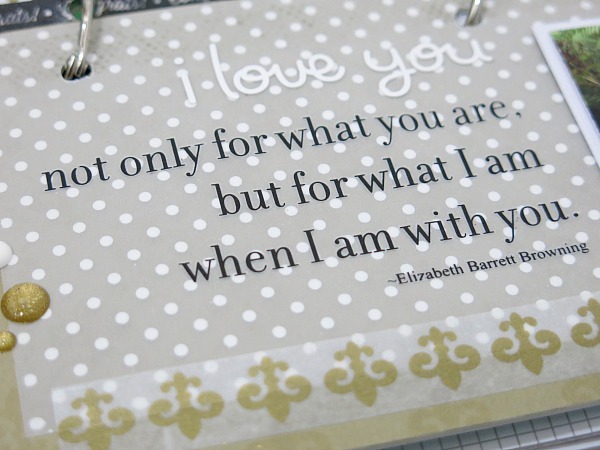 Had to pin that and also the quote Melinda used with it, beautiful! Gorgeous collection!!! It's so trendy, love it. Thanks for a chance to win!!! I pinned about this giveaway too!!! Love your book and it's a great gift. Love the Doodlebug! 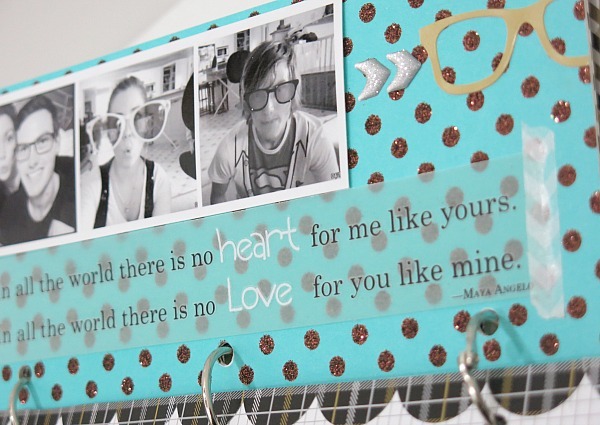 I pinned Melinda's first photo to my Pinterest page! It's so gorg!!! Gorgeous!!! And perfect, I have a wedding in September. Got some wonderful ideas! I pinned two separate images on my "Products I Want" board. LOVE this line!! !